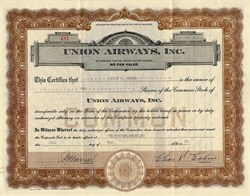 Beautiful certificate from the Union Airways issued in 1929. This historic document was printed by Goes Banknote Company and has an ornate border around it with a vignette of the company's name. This item has the signatures of the Company's President, Charles V. Eakin and Secretary and is over 79 years old. Owned and operated Capital Air Lines, Inc. and operated 8 monoplanes offering service between Los Angeles, Redding, Red Blff, corning and Sacramento; also between San Diego and Vancouver, B.C.